Indian Wells promised to be one of best tournaments of the year so far. And sure enough, the first Masters of the season, and the biggest tennis event outside the Grand Slams, delivered in spades. All the top names were present and correct except for the injured world No. 5 Juan Martin Del Potro. The biggest draws in men’s tennis, Roger Federer and Rafael Nadal, were both back from injury or illness, and the draw promised to repeat some great former matches: Nadal versus Nikolay Davydenko, Federer versus Andy Murray, and ultimately Nadal versus Federer. But very quickly, the picture changed as seeds fell like nine-pins. The likes of Marin Cilic, David Ferrer, Gilles Simon, Gael Monfils, Radek Stepanek, and several more, went in their first matches. 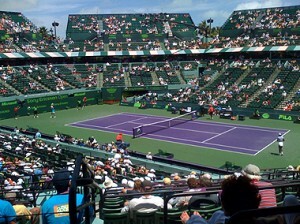 In the next round, it was Federer, Davydenko, Fernando Verdasco, and Juan Carlos Ferrero. Murray and Novak Djokovic looked less than convincing in their progress to the quarters and fourth round respectively, and so it turned into a tournament where many of the old guard could show their credentials. Joining a pumped up Nadal and a powerful Robin Soderling in the quarterfinals was a resurgent set of long-established names such as Ivan Ljubicic, Juan Monaco, and Tommy Robredo. It made for fascinating tennis, capped by a final between two men with a combined total of 22 years on the professional tour, neither with a win at Indian Wells. Their outstanding performances deservedly take them to the top of our Power Rankings. Thrills and spills, big wins and surprise losses, seeds falling and new faces shining. 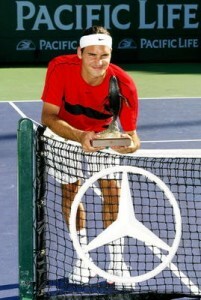 Indian Wells has lived up to its billing as one of the biggest and best tennis events in the tennis calendar. The venue is stunning, the crowds are huge, and the tournament began with a near-full complement of players—give or take the Williams sisters’ usual boycott and Juan Martin Del Potro’s injury. It even attracted the very best of both current and past players in the tastiest exhibition night in living memory. As if Andre Agassi and Rafael Nadal facing Pete Sampras and Roger Federer wasn’t enough, the Hit for Haiti scheduled Steffi Graf and Lindsay Davenport against Martina Navratilova and Justine Henin. Tennis courts don’t come more laden with star quality. Even the Indian Wells draw looked set to deliver up everyone’s favorite matches during the last few days. There was the tantalising prospect of Nikolay Davydenko outhitting Nadal for the fourth consecutive time in as many months. There was a chance that Andy Murray could seek revenge over Federer for his Australian Open defeat. Best of all, there was the prospect—should the cards fall right—of two mouth-watering finals: Nadal against Federer and Kim Clijsters again Henin. However, while some of the anticipated fireworks turned into damp squibs, there were also bangers and sparklers aplenty to keep everyone on the edges of their seats.